Home / Columnists/ Stymieing hate speech laws: silent night or saturnalia? Stymieing hate speech laws: silent night or saturnalia? Today is >Saturnalia, an ancient Roman festival of feasting, mayhem, madness. (Sometimes, still, subtly or subversively, it is observed in Colombo’s bacchanalian quarters!) Tomorrow night, choirs – around Sri Lanka as much as the rest of the Christian world – will speak of joy and love and peace at >Christmas with §Silent Night§ among other carols hymning praise of grace and mercy. Christmas in the post-Holy Roman Empire / modern-world epoch has surely supplanted the Saturnalian revels of the old Roman Republic and the era of the ancient Graeco-Roman civilisation. But the shades or the spirits of both Christmas’s §Silent Night§ and Saturnalia’s midnight revelry serve to inform and influence some of our political and cultural practices. These two festivals also provide a point~counterpoint to the recent tension in the Sri Lankan socio-legal fiesta centring on the ethos of hate speech and the proscription thereof. Christmas – at least as envisaged in the popular carol §Silent Night§ – is a time of joy, love, peace, grace, mercy. The popularity of that carol belies its simplicity and its spontaneity of origin. For §Silent Night§ was composed overnight – quite literally: @simply. @spontaneously. The story has it that §Silent Night§ was originally a poem written by Joseph Mohr, an Austrian clergyman, in 1816. The poem became a carol when something of an emergency took place on Christmas Eve, in 1818, when the church organ in Oberndorf, a small alpine Austrian village, broke down. When he heard of it, Mohr gifted the poem §Silent Night§ to his friend Franz Xavier Gruber. Then Gruber sprang into action, composing the simplest chords for guitar – and the later well-beloved carol §Silent Night§ was born… in time for Christmas Eve mass in an organ-less village church! The genesis of Sri Lanka’s proposed reforms to our country’s Penal Code, with a view to criminalising hate speech, bears some resemblance to the origins of §Silent Night§. Playing the role of Joseph Mohr was then National Languages and Social Integration Minister Vasudeva Nanayakkara, who once presented a Cabinet memorandum recommending that Sri Lanka create laws by virtue of which any form of hate speech would be deemed a criminal offence. Implicit in that memo was the suggestion that the present Penal Code was lacking the musical grace notes to address the issue – In other words, the country’s ‘church-organ’ was not functioning as it should! It wasn’t long before another Cabinet, acting on the seminal memo, approved a proposal to amend the Penal Code to prevent – and punish – acts tantamount to hate speech. In the role of Franz Xavier Gruber was Justice Minister Wijayadasa Rajapakshe who drove through Parliament the proposals to amend the Penal Code that could stem the lacunae in the law – Or, to continue with the §Silent Night§ analogy, this minister virtually overnight composed the chords that bound our country to the joy, love, peace, etc., etc., that anti hate-speech legislation could bring. Only the root causes of the Mohr-Gruber combine were different from the Nanayakkara-Rajapakshe duo’s rationale. The composers and musicians responsible for §Silent Night§ were responding to a minor niggle on Christmas Eve, when the absence of a church-organ might have rendered the flickering candles a little paler in the unmusical confines of a backwater alpine congregational setting. The proposers and animators driving the much-vaunted Sri Lankan Penal Code reforms were acting to stem the tide of a major nuisance on our own Crystal Night or Kristallnacht – when, like the Nazis contra the Jews of Germany, the rabble-rousers of a chauvinistic Lankan organisation threatened to set our Sri or blessed country ablaze again with their inflammatory invective à la Aluthgama and Beruwala. Mohr and Gruber came to the rescue of a little alpine community of faith. Nanayakkara and Rajapakshe, among other voices who agitated for the hate speech-curbing legal reforms, were moved and shaken by the larger congregation of faithfuls representing the recommendations of Sri Lanka’s erstwhile Lessons Learnt and Reconciliation Commission (LLRC). Conventional Wisdom (What *Civil Society* is saying): Anti hate-speech legislation is a spontaneous overflow of strong emotion against rabble-rousing in a peaceful democratic society with a Penal Code that lacked the teeth to cut up and spit out chauvinist invective! 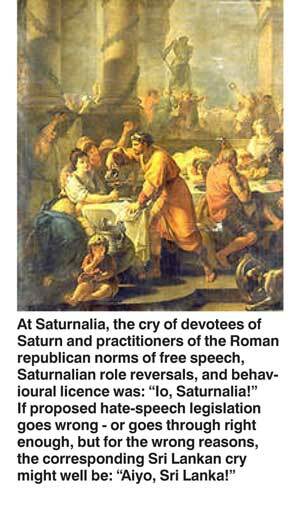 Saturnalia was a Roman holiday on 17 December, later extended up to 23 December, in honour of the Titanic deity Saturn. Romans looked back to a Golden Age, when, under Saturn’s benevolent divinity, humanity enjoyed earth’s bounteous harvests sans the burden of labour – a beneficently edennic state of innocence, for which lost mythical time humans now or then give thanks to their divine benefactor. Once the religious aspect of the festival – a sacrifice to the Saturnine god – was done, in Saturn’s Temple in the Forum, the more riotous aspects began. For the Roman public, there was a mass banquet. In private, republicans partook of lavish meals followed by gift-giving. In public and in private, there was one week-long party, when and where a carnival atmosphere prevailed. The Roman poet Catullus referred to the jocundity and bellicosity as being among “the Best of Days” under the old republic. Many social norms were challenged, and even seemingly changed. For instance: masters and slaves exchanged places. Freedom of speech was encouraged – with otherwise comatose slaves being urged to critique and condemn their generally morose masters. This was one of several festivals in the Graeco-Roman civilisation characterised by #role reversals and #behavioural licence. Which makes interesting reading for Sri Lankan republicans (whether masters or slaves, themselves) with a sense of history as well as a sense of irony. Masters and slaves swapped places. Masters – used to being treated slavishly by ^diakonoi (stewards), ^douloi (slaves), and ^oiketai (household employees) alike – might even prepare the meals and serve them. Slaves – never the subject of treats and favours – would be served first, and be waited upon by their masters at table. Slaves and masters would have dined together later. Slaves were also granted leave to feign disrespect for their masters. The pretence went as far as total liberty in the things that were tolerated in regard to free speech. The Roman poet Horace referred to such freedom of speech as “the December Liberties”. The same Augustan poet captured this spirit of %give-as-good-as-you-get% when he wrote about a slave who offered his master some sharp and saucy criticism. However, it was all a farce. As everyone knew well enough, the pretence would not last long. There would – and could – be no true equalising of the social hierarchy – even though there should have been such a levelling. Instead, the holiday ended on the next day! The freedom of speech afforded to the oppressed classes was all-too temporary, and was never in danger of challenging – let alone changing – the status quo. This becomes pertinent to us because something of a ‘role reversal’ as regards ‘behavioural licence’ has taken place. Where once civil society agitated in favour of laws that would curb the baited tiger of hate speech, now it is like a roaring lion at bay seeking to devour those who would bring such laws to pass! The very same – well, virtually and essentially the same – civil-society organisations which once championed hate speech-oriented legal reforms are now militating in favour of free speech and against the proposed legislation. In a surprising role reversal, government has backed down from its bold-faced stance against BBS-type inflammatory invective à la Aluthgama/Beruwala in the face of civil society’s court injunction-backed stand in favour of free speech – even if such liberty gives rumour-mongers and rabble-rousers licence to practise their damnable trade. So what happened? Devil’s Advocate (What *Some Seers* are suggesting): There are vested interests at work against the proposed reforms. These hidden agendas range from the rights of ethnically divisive and divided political parties to the lame-brained, tender-minded philosophies of civil libertarians and other left-wing intellectuals and groups. Naïve (the simplest perspective): Civil society changed its mind about the proposed reforms to curb hate speech. Government is paying attention as good governments can or must. Necessary (a pragmatic stance): Civil society senses the need to proceed with caution. Government is paying heed. Naughty (a cynical point of view): Public interest litigation is pandering to political parties and other civil-society players with hidden agendas/vested interests. State actors are complicit – or simply happy to comply. Nasty (the subversive lens): Public interest litigation is subtly critiquing and challenging the status quo. State actors are presently in a quandary as to how to proceed and have put up shutters. I don’t know what stance conventional wisdom will take… but I’m happy to play devil’s advocate and give civil society / public-interest litigation against the raft of proposals against hate speech the benefit of the doubt. There are worse things than egregious flouters of the PTA getting away with hate speech – there is the possibility of innocents being slaughtered under it (remember J. S. Tissainayagam? ), or belligerents being crucified by it (don’t forget the Field Marshal, who was generally regarded as one of a trinity of war victors, who then fell foul of the Powers That Be). So let’s hasten slowly towards the maturing of our polity and the streamlining of our Penal Code… the point is not to expedite reforms that are bad in law and potentially ugly in intent, but to do one’s best for the good of the widest national interest in the right time. Festina lente! All haste will do is bring hate-filled bullies and base foul-mouthed scoundrels to book… or not – as is the case now – and only to find that while the most grievous offenders get off scot-free, we (by default) have bagged the wrong fish for the wrong reasons (by design).